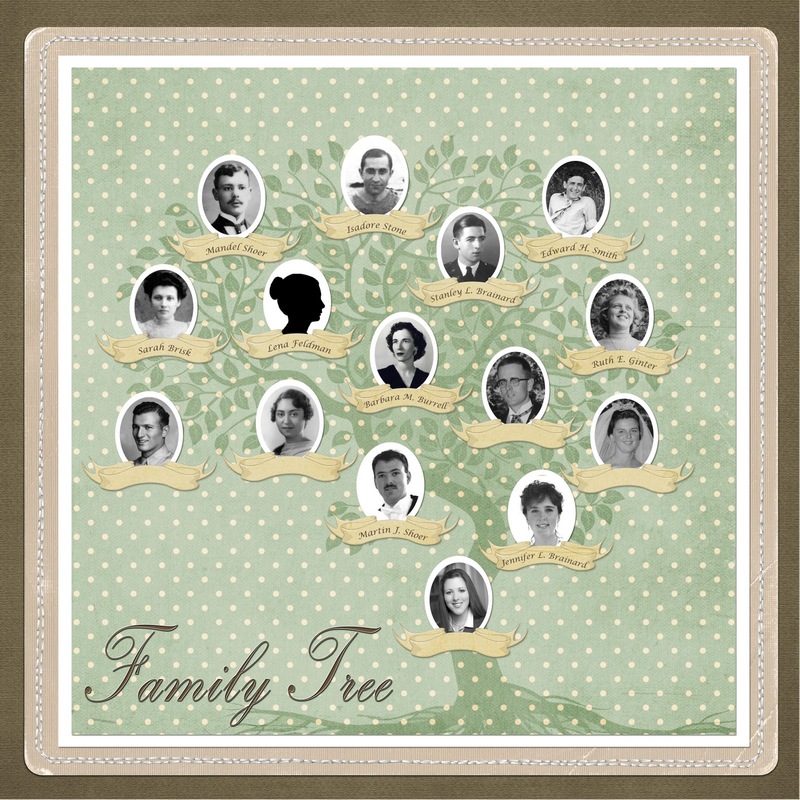 Family trees and pedigree charts are two basic genealogy tools. Genealogists use them from the beginning to record known information and frequently consult and update them throughout the research process. 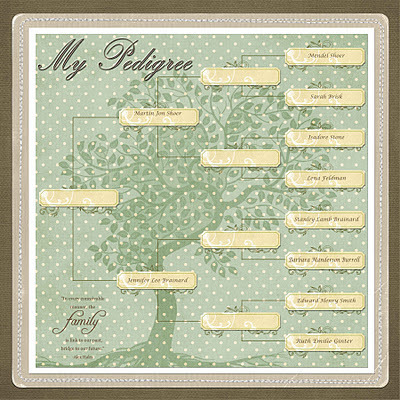 Family trees and pedigree charts can also be useful for the end users, the family members or clients who will be presented with the research results. Have you thought about adding visual elements to your trees or pedigree charts to make them more appealing to your target audience? Family History Album: This is a continuation of our blogging group's progress in the Family History Album Class from JessicaSprague.com. If you have missed the prior posts and to see who else is participating, please click the Family History Scrapbooking link above. 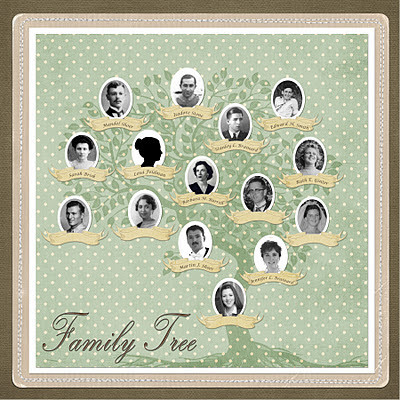 When I was saving web ready copies of my family tree and pedigree chart pages to post on my blog, I left blanks instead of names for our living relatives; our parents and children. Of course, it is easy for you to get that information by doing simple searches on websites such as Intelius, People Search, Veromi, mylife and of course, the White Pages, but it is important to me to respect their privacy. Go ahead, search for yourself and see how many related names appear. Lucky to Have Blanks: At first I felt uncomfortable about presenting what looks like an unfinished tree, but then I realized that really, we are so lucky to have a tree with blanks. Challenges/Feedback & Scrapbook Sunday: How did your week go? Did you create any heritage or family history scrapbook pages or projects? Consider submitting them for the new weekly Scrapbook Sunday blogging prompt. Let me know what you are up to. I love seeing other people's creations and getting new ideas. And they are lucky to have you to remember them! I think we must have posted within ten minutes of each other. We must be in synch. Jen I love the polka dots! Fabulous! I like that you used the silhouette of the woman when you don't have a photo. I am going to do the same. aargh! I want my computer back so I can do mine. After looking at everyone's post I really want to get going. Nice job! Val, You must be in total withdrawal. Or, maybe you are enjoying the peace? Hope your computer finds its way back to you soon. You were only missing 1 photo?? Oh dear, my chart will look very naked! !